Is a solar virus coming to plunge the world into chaos? Edward Snowden, the most wanted man on earth today, continues to leak information as he enjoys asylum under the protection of Russia. He has bounced from country to country seeking refuge and fleeing US prosecution. There is a $1 billion dollar bounty on Snowden to bring him back to America to face charges of espionage. Snowden also leaked information to the British newspaper, The Guardian, about the US eavesdropping known as Prism. He told The Guardian that the US government was spying on other countries via eavesdropping on phone conversations, email, and search engines. The US government was not only eavesdropping on European Allies, but on unsuspecting American citizens as well. Snowden made another remarkable revelation in which he said that the Obama Administration fears a raging pandemic due to solar storms that may very well alter life on this planet as we know it. Snowden provided Russian authorities with a USB flash drive that contained information from the Ministry of Health. This report contains 20,000 pages from the US State Department's 2004 shocking report, in which President George Bush said, "Climate change over the next 20 years could result in a global catastrophe costing millions of lives in war and disasters; that disruption and conflict will be endemic features of this life and concluding that once again warfare would define human life." Glen Greenwald, an American reporter in Brazil, said he also has the 20,000 pages of Snowden's leaked top US classified secrets. He is afraid to release them because of the Obama's Administration's "open kill order" on those who leak those files. The MOH report said that this coming fall or winter, a massive reversal of the sun's magnetic field would not only severely effect our weather and radio transmissions, but would also genetically create mutant deadly viruses. This coming "solar flip" will kill millions in an apocalyptic-type catastrophe. A report released in 1990 by two British scientists, said that solar activity (sunspots) were related to every incident of viral influenza epidemics and pandemics in human history. Snowden released documents that reveal dangerous type viruses like Influenza A H7N9 and Porcine Epidemic Diarrhea (PED). These have killed millions of pigs in the US this year and show no sign of stopping. The Snowden leak also revealed that the US government purchased 1.5 billion rounds of ammo in 2012 and will purchase another 1.6 billion rounds in the next four to five years. The Obama Administration fears "social anarchy" will develop as tens of millions of Americans die and the economy collapses due to what the MOH says will be, "the worst pandemic disaster in human history." Folks, this story is not from some Christian fiction or some sensational prophecy website, but from the Ministry of Health themselves, and what they are saying is a page right out of Bible prophecy. 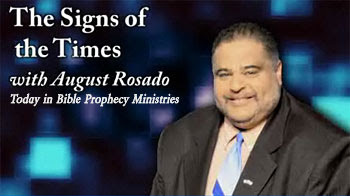 Revelation chapters 6, 9, 15 and 16 speak of a global catastrophe upon the world that will result in a global holocaust. Revelation 6:8 speaks of a fourth of mankind being killed just from the first four Seal Judgments. Revelation 6:12 records the Sixth Seal Judgment which results in a devastating earthquake, the sun being blacked out (black as hair, John says), and the moon becoming as blood, probably due to nuclear fallout. The Seventh Seal Judgment in Revelation 8:1 contains another series of sevens to hit the earth — the Trumpet Judgments. Revelation 8:7 says the third of trees and grass was burnt up, and verses 8-9 tell us that a great mountain burning with fire (possibly a large missile of some sort in great size) will contaminate the sea killing all fish life. Revelation 8:10 records the Third Trumpet Judgment as a star falling from heaven hitting the drinking waters. This is possibly a nuclear missile re-entering earth's atmosphere and polluting the drinking water. Verse 11 calls the star "Wormwood," and in the Russian language they would call Wormwood "Chernobyl." Revelation 8:12 records the Fourth Trumpet Judgment as the sun, moon, and stars are blacked out, possibly due to radiation fallout. Revelation 9:2 speaks of the Bottomless Pit being opened, spewing such thick black smoke that it blots out the sun and decreases the oxygen, which will suffocate people. Only nuclear fallout can create such a devastating effect on mankind. Revelation 9:18 speaks of another third of mankind being wiped out — one and a half billion people — due to these atmospheric convulsions from the Seal and Trumpet Judgments. Then come the Bowl Judgments. Revelation 16:1 records the Vial or Bowl Judgments. Verse 2 speaks of grievous sores on those people who took the Mark of the Beast. Radiation can cause severe burning and blistering boils on the human body. Verse 3 again records the oceans being contaminated and killing all sea life. Verse 4 records all drinking water being contaminated and killing men. Verses 8-9 speak of men being scorched with fire. Again, they could be severe burns due to intense heat from a nuclear blast. Revelation 16:10-11 speaks of blistering sores in men's mouths so that they chew on their tongues to relieve the pain. Because of these plagues they blaspheme God. Second Peter 3:10-12 tell us of the earth being destroyed by fire, as well as Zechariah 14:12. Isaiah 24:6 tells us that the earth will be destroyed by fire. With this news story, and more revelations by wanted fugitive Edward Snowden, the stage is being set for Bible prophecy to be fulfilled. Hate to differ, but these things are NOT, NO WAY, NO HOW related to "global warming", oh, excuse me, now it's, uh, "climate change". "Climate change" is a liberal political agenda fantasy being used by some to control our lives (what kind of car we buy, how much energy we use, etc.) and by other to get rich (Solyndra). Any coming disasterous events will be based SOLELY on The Word. It has NOTHING to do with whether or not I drive an SUV or use my air conditioner in summer. Please don't give ANY credibiltiy, even unintentional, to the "climate change" fanatical liberal facists. "Climate change" means MAN is in control. The Word and Bible Prophecy means GOD is in control. I wonder how much research went into this article. Huh? Didn't see where this article said anything about climate change. .???? "This report contains 20,000 pages from the US State Department's 2004 shocking report, in which President George Bush said, "Climate change over the next 20 years could result in a global catastrophe costing millions of lives in war and disasters; that disruption and conflict will be endemic features of this life and concluding that once again warfare would define human life."" Nathan's notation "While it's pretty clear that the current administration listens to a lot of bad advice, how they act on that advice is inherently important to us all." I think gets the REAL danger here. It is NOT this mythical solar reversal or whatever. It is how this president will use "bad advice" based on whatever event may occur (or just the threat of such an event) in order to strengthen his power. I can see Obama using executive orders, martial law, suspension of rights and elections, whatever he wants to basically, to perhaps obtain dictatorial powers and status. I used to laugh when I heard others talk like this. I don't anymore. This is the REAL threat, not some solar disturbance that may or may not happen. Obama is going to leave office in three years. Unless this happens quickly, he will not suspend the constitution. Whomever succeeds him would have up to 4 to 8 years. I read on National Geographic that these reversals happen every 11 years. What is unique about this one? My understanding is that these solar "fips" occur regularly every 11 years. Therefore, we've lived through it many times before and probably didn't even know it. What's so dangerous about this particular "flip"? More likely it's another "false flag" excuse to jab everyone in the arm with a vaccine against the supposed pandemic. If you'll do the research, you will quickly figure out that these vaccines contain many, many harmful things and do nothing to prevent the flu really. There are many toxins (and cancer causing agents in them) and they can have some vicious and even deadly side effects. Read the Georgia Guidestones. The goal of the "shadow world government" is to REDUCE the world's population down to no more than 500 million people, a more "manageable" number "they" say. You can listen and watch Bill Gates himself say so on Youtube. It's not a secret. He stated that with the current vaccination program (and other related programs like abortions, etc. )in place, we would be able to get 10% - 20% closer to that goal soon. I see the article mentions a "Ministry of Health." The United States does not HAVE A "Ministry" OF ANYTHING. The USA uses "Department" not "Minstry", as in, the Department of Health, or the Department of Energy, etc. So, why, then does the article talk about the U.S., and yet talk of a "Ministry of Health", which does not apply to the United States at all? It's true that the earth will be destroyed by fire, but this doesn't happen until after the Great White Throne judgment and will not be by man-made nuclear means but by the supernatural hand of God. Good to see the article's got people thinking! Usually like Chicken Little such crazy claims make people run around thinking the sky is falling. Sadly, that's what many in the gov do when they hear such reports, and as August wants us to see, are preparing for. This affects us greatly when men are deceived. That's why we need to rely on what the Bible teaches alone, as the second half of the article lays out for us. The US does not have a Ministry of Health. There is a Department of Health and Human Services overseen by Secretary of HHS. Unfortunately, indicating information is from a non-existent department of the US government raises questions about the accuracy of the information. The source of this article is Sorcha Faal. I can't believe people still fall for this stuff. Get rid of Obombus, get rid of the problems. So......They're gonna say the suns C.M.E is whats gonna spark these Man Made Viruses ???! It's sad to see a place so boldly proclaiming Christ fell for this old news scam story. IT circulates from one source to another but fact is Snowden never said anything about solar flares. And yes, it is true that the sun reverses it poles every 11 years or so,so big deal. Yes, to the above comment a few posts up--Sorcha Fall did indeed post this but she simply quoted the original site that published the scam report of Snowden and the supposed solar flare leak. As for Sorcha, she;s not been right on even ONE of her "shocker" reports in the 18 months or so since I first read her site. What is more curious is how people, as self identified Christians (ministries too, like this one) who claim to have the "Spirit of Truth" residing can be so easily fooled/scammed. No wonder the church is full of so many differing interpretation of scripture, and yet each one claiming to to be correct in their translation/interpretation. Isn't the sun's magnetic field suppose to flip every 11 years, or so? Bookmarking this page so I can read it again next summer. Again, as stated in the note and my subsequent comments, we know the report is hogwash. It's how administrations act towards such reports is what this article is about, and how such hysteria can be useful to them and possibly play into the end times scenarios. Re: "Revelation 9:2 speaks of the Bottomless Pit being opened, spewing such thick black smoke that it blots out the sun and decreases the oxygen, which will suffocate people. Only nuclear fallout can create such a devastating effect on mankind." Actually, I don't think nuclear fallout relates to the "bottomless pit". It is not the only thing that can darken the sun and the air. Consider super volcanos, like the one under Yosemite National Park. If that blew up it would really darken the sun and air. But even that is not bottomless so I don't think that's it either. The focus of the chapter is the locusts from the pit and their king. I think the meaning and nature of the bottomless pit and the subsequent locusts will become clear when God allows it to be opened. There's certainly no harm in taking God at His literal word here. We don't have to try and fit it in with what we know today. Indeed, nuclear weapons may be involved in future wars, but this is something else. I think the bottomless pit, the black smoke, the locusts and the suffocation is the perfect description of what the world is in for when they open the flood gates to immigrants from Africa.